Farfesha Belly Dance, Learn to Belly Dance the Joyous Laughter Way! 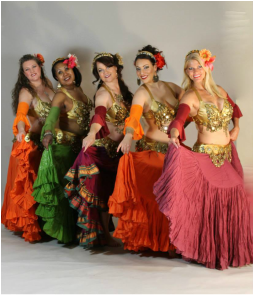 Under the direction of Michelle Morrison, Farfesha Belly Dance is a professional belly dancing company located in Albuquerque, New Mexico, USA. Belly Dance is a path to physical fitness and greater body awareness. It allows a woman to discover and appreciate her individual beauty. Our dance philosophy is based entirely on our name. Years ago, we had the good fortune to meet Egyptian music historian George Sawa, who, after spending the evening in our company declared we were full of "joyous laughter." Hence the name Farfesha. Farfesha's goal is to bring the joy of this dance to our students and audience. Through our classes, shows, productions and workshops, we seek to help every woman bloom. If we can bring a little laughter and joy through our endeavors, so much the better. In fact the expression "Fesh" has come to mean that on-stage high-energy delight. Have you got Fesh? On these pages, you'll find performances, photos, and articles on many subjects (including how to dye silk, make tassels, produce a show and wrap a turban). You can also find Michelle's acclaimed instructional belly dance videos.